Productivity rises at Chinese firms in the same industry as a new joint venture, especially when the international partner is from the United States. When foreign firms set up joint ventures in China, there are spillover effects on many Chinese firms, not just those involved in the new joint ventures. The other firms often gain new technology and become more productive. These benefits typically outweigh the negative effect of increased competition that the joint venture represents, according to findings reported in International Joint Ventures and Internal vs. External Technology Transfer: Evidence from China (NBER Working Paper No. 24455). The overall benefits to Chinese firms from international joint ventures are larger than those from other types of foreign direct investment (FDI), such as wholly owned foreign enterprises. And the benefits are larger if the foreign partner is from the United States rather than from Japan, Hong Kong, Macau, or Taiwan. "U.S. partners roughly double the productivity gains of joint ventures, relative to non-U.S. foreign partners," write Kun Jiang, Wolfgang Keller, Larry D. Qiu, and William Ridley. "One explanation for this is that U.S. firms tend to be closer to the world's technology frontier than non-U.S. firms, and as a consequence they transfer more (or better) technology to their Chinese joint venture." The popularity of international joint ventures in China has waned in recent years, likely because wholly owned foreign enterprises appear to be better equipped to safeguard their intellectual property and other proprietary technologies from dissemination to domestic firms. In 1997, equity joint ventures represented 43 percent of FDI while wholly owned foreign enterprises accounted for 35.8 percent. By 2007, equity joint ventures accounted for only 19 percent while wholly owned foreign enterprises represented 77 percent. In some industries, China's foreign investment policy requires foreign firms to partner with a local business. However, international joint ventures remain an important source of FDI. In 2015 alone, foreign companies set up slightly more than 6,000 new joint ventures in China, accounting for $27.8 billion of FDI. By matching official international joint venture listings with enterprise data from China's National Bureau of Statistics and patent applications from its State Intellectual Property Office, the researchers examine all the domestic partner firms with annual sales of at least 5 million renminbi operating at any point between 1998 and 2007. They find that foreign investors tend to partner with large, profitable, highly productive firms operating in labor-intensive or high-tech manufacturing industries. The Chinese partners also tend to have a strong export base, a portfolio of patents, or government subsidies. 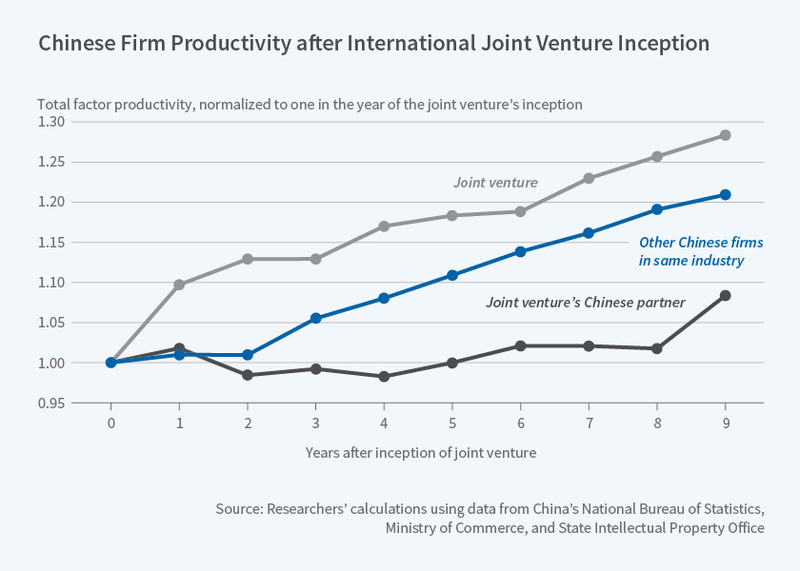 International joint ventures are some 30 percent more productive than Chinese firms that are not joint ventures, and generate patents at a 2.2 percent higher rate. The Chinese partner firms in these ventures also benefit from these ventures in their business units that are not part of the joint venture, with 5 percent higher productivity and 0.8 percent more patenting. This effect is smaller than for the business unit that involves the joint venture, in part because there is no incentive for the foreign firm to transfer technology to the partner company and partly because the partner is generally large, so productivity improvements would have a relatively smaller effect than for the joint venture itself. When the researchers test for spillovers from joint ventures to other Chinese firms in the same industry, they find the largest effects for companies that are also engaged in joint ventures.